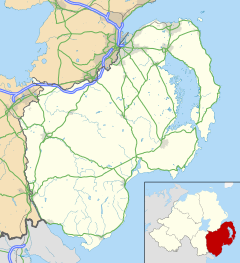 Kilkeel (from Irish: Cill Chaoil, meaning "church of the narrow") is a small town, civil parish and townland (of 554 acres and 6521inh) in County Down, Northern Ireland. It is the southern-most town in Northern Ireland. It lies within the historic barony of Mourne. Kilkeel town is the main fishing port on the Down coast, and its harbour houses one of the largest fishing fleets in Ireland. It had a population of 6,887 people according to the 2011 Census. The town contains the ruins of a 14th-century church and fort, winding streets and terraced shops. It is located just south of the Mourne Mountains. Altogether there are 69 townlands in the civil parish and barony. Kilkeel takes its name from the old church overlooking the town, it being the anglicised version of the Gaelic 'Cill Chaoil' meaning "Narrow Church" or "The Church of/in the Narrow Place." The name may be drawn from the church location on a narrow site above the town. The church was constructed in 1388 and dedicated to "St Colman Del Mourne". It was thought to be the principal church in a group which included Kilmegan and Kilcoo despite the fact that Kilkeel was very sparsely populated in the Middle Ages. There are references to Kilkeel as a Christian settlement as far back as the 11th century. The cemetery attached to the church was used for burials until 1916. The last burials at the cemetery were victims of a collision between two steamers the Retriever and the SS Connemara in Carlingford Lough. On 30 May 1918 a fleet of Kilkeel fishing boats was sunk by the U-boat UB-64 under the command of Otto von Schrader. The boats sunk, 12 miles off the coast of County Down, included the Jane Gordon, Cyprus, Never Can Tell, St Mary, Sparkling Wave, Lloyds, Marianne Macrum and the motor vessel Honey Bee. Only two boats, Moss Rose and Mary Joseph, were not sunk and the crews returned to port on those boats. The Mary Joseph (N55) is now in the Ulster Folk and Transport Museum. A local history group, set up in the 1980s and covering both the town of Kilkeel and the Mourne region, has produced a set of seven periodicals called The 12 Miles of Mourne. A book on Hanna's Close, a clachan of houses in Aughnahoory townland one mile outside of Kilkeel, that covers the history of the region up to 1798, was self-published in 2008. Fishing is a major industry in Kilkeel, with Kilkeel Harbour the home port for the largest fishing fleet in Northern Ireland. There are fish-processing factories around the port, pleasure angling off the piers and lobster farming along the coastline. Whitewater Brewery (established 1996) brews and sells Belfast Ale. In recent years Collins Aerospace (previously known as BE Aerospace) has become the largest employer in the area. Its Kilkeel facility, which manufactures aircraft seats for a worldwide customer base, employs over 800 people. See also: Category:People from Kilkeel. The town is also known as the location where William Hare died. Robert Hill Hanna (1887–1967), born near Hanna's Close, was an immigrant Canadian recipient of the Victoria Cross. He was a Company Sergeant-Major in the 29th (Vancouver) Bn., Canadian Expeditionary Force during World War I when on 21 August 1917, he led a courageous action at Hill 70 Lens, France. 8.93% had some knowledge of Ulster-Scots and 8.82% had some knowledge of Irish (Gaelic). The town of Kilkeel has a strong Unionist heritage. In 2001, the ward of Kilkeel Central was recorded as 69% Protestant (21% Catholic, 10% other), and the ward of Kilkeel South was 37% Protestant (55% Catholic, 7% other). Gaelscoil na mBeann is a bilingual primary school that uses the Irish language as its primary medium of instruction while English is introduced at Primary 3. The school teaches the Northern Ireland curriculum. It was established in 2010 by a group of local people and parents who wanted Gaelic-medium education for their children. The school gained recognition and funding from the Department of Education in 2012. Most popular sports in the Kilkeel area include Football, Hockey, Gaelic football, fishing, golf, hurling, and swimming. There are five Gaelic Athletic Association clubs in the local area which include An Ríocht, Longstone, Atticall, Ballymartin, and Glasdrumman. Each club boast impressive facilities including playing fields, sports halls, fitness suites, bar facilities and cater for a wide range of cross community activities above and beyond GAA sporting activities. These include Youth clubs, Mens Sheds (Pensioners), Walking clubs, Yoga, Basketball (Kilkeel Elks' home court is in An Ríocht Hall) and many more. All five teams have a strong presence in the Down GAA calendar through the various leagues and field teams at every age group from U6 through to senior level. One of the most recognised sports teams in the town is Kilkeel Hockey Club. They play at McAuley Park, fielding three men's teams and two ladies' teams. Kilkeel is the only hockey club in Mourne, drawing players from the whole of the Mourne area, with Annalong providing a considerable number of its players. The Men's 1st team have just recently been awarded the Anderson Cup in the Anderson Cup final at the Stormont pitches in Belfast which was a great achievement for the club and also for the town. The most senior football team is Valley Rangers F.C. of the Mid-Ulster Football League. Other local teams include Ballyvea, Kilkeel, Kilkeel Athletic and the Mourne Rovers. With the exception of Kilkeel Athletic, the local football clubs play in the SK Holmes Newcastle League. There are two local golf courses, Kilkeel Golf Course and Cranfield Pitch and Putt. Baron Kilkeel is a title in the peerage of the United Kingdom. It was created on 19 May 2018 by Queen Elizabeth II as a substantive title for her grandson Prince Harry on the occasion of his marriage to Meghan Markle. It is named after the town of Kilkeel. The full title and designation of the barony is "Baron Kilkeel, of Kilkeel in the County of Down". Wikimedia Commons has media related to Kilkeel. ^ "Kilkeel". IreAtlas Townlands Database. Retrieved 15 April 2015. ^ "Northern Ireland Placenames Project". Archived from the original on 1 October 2010. Retrieved 12 June 2010. ^ "Cill Chaoil/Kilkeel". Placenames Database of Ireland. Retrieved 10 November 2014. ^ O'Sullivan, Aidan; Breen, Colin (2007). Maritime Ireland. An Archaeology of Coastal Communities. Stroud: Tempus. p. 232. ISBN 978-0-7524-2509-2. ^ Hanna, R.K. (2008). Hanna of the Close – from Scottish Origins to 1798. Sheffield: Self Published. ^ "B/E Aerospace workers given pledge over US sale plan". Belfast Telegraph. 7 May 2014. Retrieved 22 July 2014. ^ "Information". Gaelscoil na mBeann. 2012. Retrieved 5 February 2013. ^ a b "Harry and Meghan appointed Baron and Baroness of Kilkeel". Belfast Telegraph. 19 May 2018. Retrieved 19 May 2018. ^ Press Association 2017. "Baron of Kilkeel is Prince Harry's Northern Irish title". Windsor Observer. Retrieved 19 May 2018.